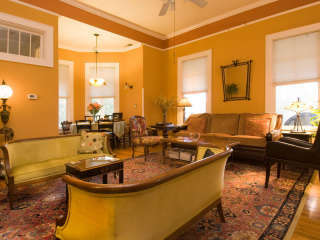 Hill House B&B is Wi-Fi connected, so bring your laptop. For a single-occupancy room for solo travelers, take 10% off your first weeknight and 40% off all additional weeknights! We’re happy to provide a continental breakfast with a baked good, juice, and coffee between 7:30 and 9 a.m., if you need to leave before we serve our full hot breakfast at 9 am.